I saw this tweet, and thought it was kind of funny. The ISS doesn't seem very big, so to find something like that seemed a little unusual to me. Mostly because it seems like there would be someone keeping track of what's on the ISS. Is that not the case? Does anyone keep an inventory? Yes, someone does keep track of ISS inventory: the Inventory Stowage Officer. The tweet does not indicate that Gerst found something unknown. It just indicates his surprise at finding something so old. 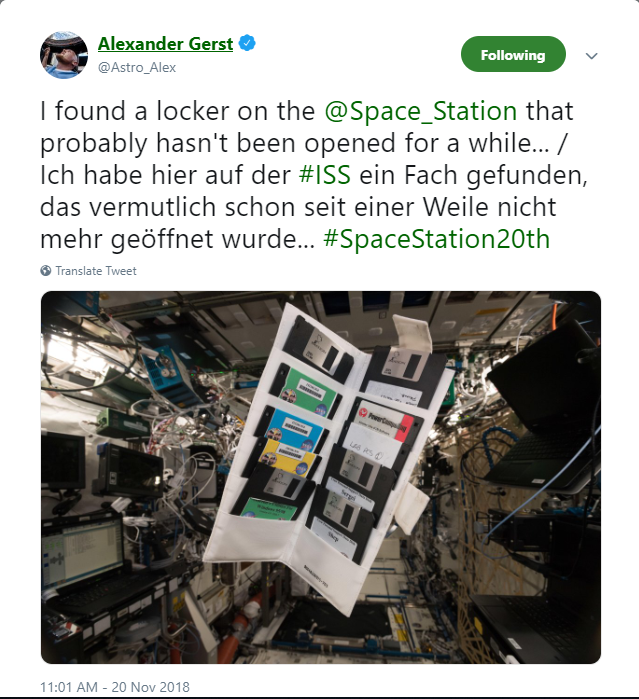 There's a lot of stuff on the ISS. Some of it dates back to the construction phase (when the Shuttle was still in use and could ferry large loads). There are lots of spare parts and other items needed to keep the station running, including floppy disks for reinstalling software it seems. There's no guarantee those disks are obsolete, by the way. The station may still have equipment that can read them. Is there a realistic looking ISS scale model available somewhere?